Themes of life, music and everyday activities have captured the artist’s imagination over the past ten years.Most of her work of late is abstract in nature. Dina Chhan was born in 1984 and currently she works and lives in Phnom Penh, Cambodia. Her love of art gives her the energy and enthusiasm to teach visual art to children and teenagers in a number of orphanages and the International School Phnom Penh. 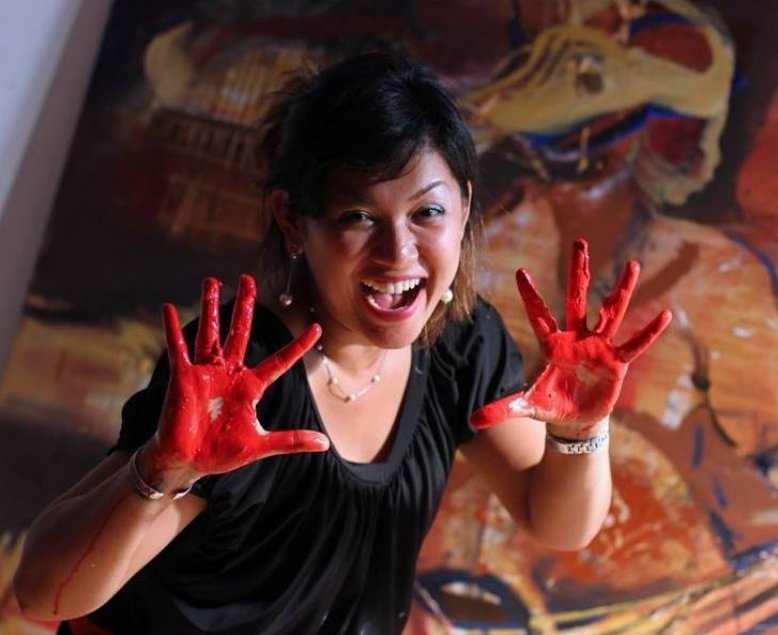 She has exhibited work in Cambodia, Columbia, France, Singapore and U.S.A. She specialises in painting and sculpture. For a duration Dina lived in a refugee camp in Poipet. Huge issues still exist with unexploded ordinance and land-mines in this region along the border between Thailand and Cambodia. Her experiences in Poipet influence her artwork to this day. She was the only female Cambodian artist to partake in the United Nations mine action program in Cambodia. Along with 9 other Cambodian artists she visited some of Cambodia’s most mine-affected provinces to observe how Cambodia is addressing the explosive remnants of war. She presented her interpretation of the issues through sophisticated sculpture. Dina plans to continue depicting dynamic and engaging works of art, capturing the energy of life in Asia. She hopes to open a workshop and gallery in Phnom Penh in the future.